Apply to Join the DDBSA! Anyone receiving this newsletter already has a demonstrated commitment to our Beloved Breed. If you are already a Member, thank you. If not please consider applying to join. Every Breed in the US has an approved parent club as designated by the AKC. 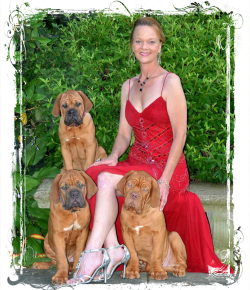 The DDBSA is the parent club of the Dogue de Bordeaux. Whether Breeder, Companion Owner, Rescue Home or just someone interested in learning more about the Breed, membership is an ideal opportunity. Members will receive our Bi-Monthly newsletter “The Slobber,” which is packed with fun, informative information. As a member there is an opportunity to really step up you game if you choose and serve on a variety of committees. Are you “crafty?” Think about helping out making raffle baskets or designing booths for rescue of show events. Are you “techy?” Maybe you could lend a hand with the web page or other various needs. Are you willing to do some driving? A cause near and dear to our hearts is our Rescue (recall our introduction to the Breed was our beloved Louis many years ago). The Club can never have too many pre-approved, trained hands on deck ready to move and race against the needle to pull a Dogue from a kill shelter in the unfortunate event that the clock is ticking. It is not uncommon to have to move a Dogue hundreds of miles to a waiting foster or forever adoptive home. From personal experience, one of the best “feel good” things you will do all year is drive a leg of a transport. Volunteers are are assigned a leg. They pull into a designated meet-up point then out jumps the Dogue with his or her little suitcase, into the next car and on up the road. Not unlike tracking Santa on NORAD Christmas Eve, updates are posted and shared as a baby with a not-so-great beginning in life moves on to know the love and warmth of a forever home. Dues are $30 annually for a single membership, $35 for a family membership and we have attached an application. In order to apply, the application will need printed and snail mailed along with a check to the designated individual. We sincerely hope that you will consider joining us in serving our breed however you can.